As of November 2018, Osher Director and former Connective Tissue Laboratory Principal Investigator, Dr. Helene Langevin, no longer works at the Osher Center. However, she continues to lead connective tissue research, along with her former laboratory manager, Dr. Lisbeth Berrueta, at the National Center for Complementary and Integrative Health. Dr. Dennis Munoz-Vergara, post-doctoral integrative medicine research fellow, is continuing connective tissue research under the guidance of Drs. Peter Wayne, Osher Director, and Anne Marie Zavacki, Osher Research Affiliate, at BWH. Imagine a body that is totally coordinated, strong and flexible, healing quickly when injured and able to fight off infections and cancer cells. This would be a body with healthy connective tissue. The goal of the Osher Center Connective Tissue Lab is to learn how to keep connective tissue flexible and free from pain, slow down aging and increase the health of the whole body. We believe that many of the seemingly unsolvable riddles of medicine (why do some injuries heal while others result in chronic pain? how does the body defend itself against cancer?) are due to the fact that their answers involve connective tissue, which medicine so far has mostly neglected. One of the limitations of conventional medicine is its fragmentation of the body into separate systems and body parts. Connective tissue is a body-wide network that connects all the systems and parts of the body together, and therefore is important for the integrated functioning the whole body. Importantly, connective tissue is sensitive to body movements, such that the way we move every day determines the shape of our “connective tissue body” over time. One of the goals of the Osher Center Connective Tissue Lab is to understand how the mechanical forces created by body movements can help connective tissue stay both strong and flexible, and heal successfully when it has been injured. We study the effects of these mechanical forces at all levels of function, from cells to tissues to the body as a whole. Stretching of connective tissue is an important component of manual and movement-based therapies such as yoga. We have shown in animal models that gentle daily stretching reduces inflammation in local tissues and improves healing after an injury. We are currently investigating the mechanisms by which stretching produces these beneficial effects, including the release of specialized pro-resolving mediators derived from dietary Ω-3 fatty acids. We also are investigating whether the beneficial effects of stretching are impaired by commonly used non-steroidal anti-inflammatory drugs such as ibuprofen. Fibroblasts are the cells that manufacture the proteins that make up the connective tissue matrix. The stiffness of connective tissue depends on the composition and arrangement of these proteins, as well as factors such as aging and inflammation. The stiffness of connective tissue is important, as stiff connective tissue can impair immune responses and promote the spreading of cancer cells. 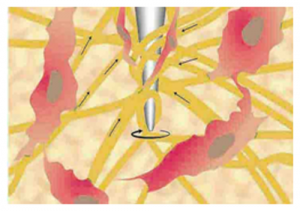 We have shown that fibroblasts can decrease the stiffness of the matrix by regulating how tightly they pull on it. We want to investigate whether stretching can preserve this property of fibroblasts in aging animals and make them less susceptible to cancer. Chronic and recurring musculoskeletal pain, especially back pain, is a source of frustration in many people’s lives and interferes with their ability to work and enjoy life. It is becoming clear that connective tissue may be the source of pain in many patients. We have shown that people with chronic low back pain have abnormal thickening and decreased mobility of connective tissue in the back, possibly due to inflammation and changes in the way people move when their back hurts. Our future goal is to investigate whether this can be prevented or reversed with specific manual and movement based therapies directed at connective tissue. So far, most studies investigating the effects of acupuncture have focused on the nervous system. Our studies have shown that, in addition, acupuncture needles mechanically stimulate connective tissue and that manual manipulation of acupuncture needles produce local effects similar to that of stretching. 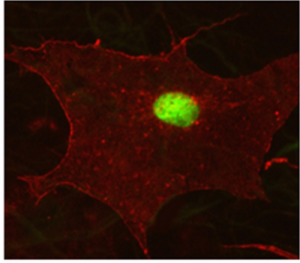 This includes dose-dependent cytoskeletal remodeling and purinergic signaling in connective tissue fibroblasts. We are studying whether mechanically-transduced signals are transmitted along connective tissue planes at a distance away from the acupuncture needle. The goal of this project is to investigate the effect of in vivo stretching in a mouse model of scleroderma. The goal of this project is to quantify the effects of acupuncture needling on connective tissue both near and away from the acupuncture needle. Langevin HM, Keely P, Mao J, Hodge LM, Schleip R, Deng G, Hinz B, Swartz MA, de Valois BA, Zick S, Findley T. Connecting (t)issues: how fascia biology can impact integrative oncology. Cancer Research (2016) 76(21): 6159-6162. Berrueta L, Muskaj I, Olenich S, Badger JG, Colas R, Spite M, Serhan CN, Langevin HM. Stretching impacts inflammation resolution in connective tissue. J Cell Physiol (2016) Jul;231(7):1621-7. PMID:226588184. Bishop JH, Fox JR, Maple R, Loretan C, Badger GJ, Henry SM , Vizzard MA and Langevin HM. 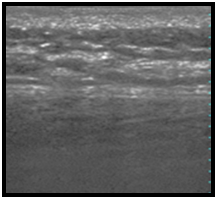 Ultrasound evaluation of the combined effects of thoracolumbar fascia injury and movement restriction in a porcine model. PLOS ONE (2016) Jan 28:11(1):e01476393. Jacobson EE, Meleger AL, Bonato P, Wayne PW, Langevin HM, Kaptchuk TJ, Davis RB. Structural Integration a an adjunct to outpatient rehabilitation for chronic non-specific low back pain: a randomized pilot clinical trial. Evidence Based Complementary and Alternative Medicine. eCAM (2015) 2015:813418.